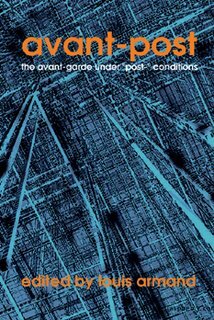 That's Avant-Post people, not to be confused with the post-avant. The latter is either a school of poetry or a hopelessly vague abstraction, depending on whom you task. The former is a new book edited by Louis Armand, featuring work by a host of notables. And my essay "The Death of the Critic," which is about Benjamin Friedlander, among others. And about the fate of lit crit in these our indifferent times. Contributors include Johanna Drucker, Michael S. Begnal, Lisa Jarnot, Ann Vickery, Christian Bök, Robert Archambeau, Mairead Byrne, R.M. Berry, Trey Strecker, Keston Sutherland, Rachel Blau DuPlessis, Robert Sheppard, Bonita Rhoads, Vadim Erent, Laurent Milesi, and Esther Milne. Check it out! Also worth checking out: recent posts on Adorno's Aesthetic Theory by both Mark Scroggins and Dave Park. I'm meant to join this cross-blogging phenomenon, and am now the Official Laggard of the group.